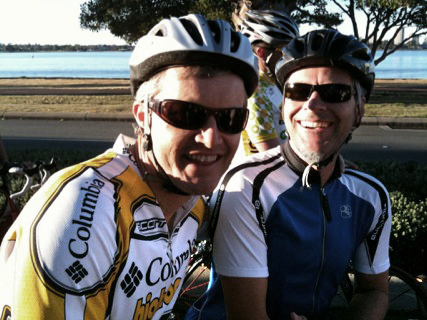 Had a 104km ride in Perth today, this is a pic of my mate Ben and I all lycra’d up!! We managed to get around the river twice in 2.55 hours about an average of 34km per hour. One thing Benny and I had in our favors is our training on the hills down here in and around Dunsborough. We had a distinct advantage over our Perth cousins who must do all their riding on the flat. Or maybe they are just bred a little soft in the city. The next ride we are thinking about is the great ocean rd, 145km’s. Did anyone else go into the ride, or get out and take photos of it. Saw a few people with cameras. The results are in. I came 115th out of the 500 plus riders doing the two laps of the river. Time was 2.55h at an average speed of 35.6kph. The best guy did it in 2.40h at an average of just under 40kph. How’s your back end after 100km?? So you were part of the reason the on ramp at Mill Point Rd was closed. still sore this morning Jamie. You could say I feel like a new inmate at Canning Vale Prison!! Yep it was us Merv, go lycra power!!! you blew the exposure on this one sorry, too bright in parts and under exposed in others. Did you shoot in RAW, if so maybe try out that pseudo-HDR to try to recover some detail in the shadows, and have a play with the recovery slider too…. MTBs are more my scene than roadies, still, pedal power rules ! nice one Brett, luckily I didn’t take the photo but it was shot on my iphone. I will take your tips on board and see what I can do. As for running some hdr over it I actually tried that!!! didn’t work though hehe. Mountain bikes are ok but you can only go fast downhills, we go fast everywhere!